During a time when the news cycle is filled with stories of tension between police officers and their communities, we invite you to learn about one local effort in Manchester that offers hope for the future. Officer Levasseur offers a little first aid during a training session. 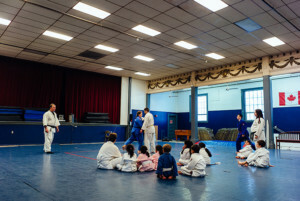 The MPAL Judo club is directed by Head coach/Sensei Robert Proksa, 3rd dan USA Judo. Cops helping and inspiring kids: In these contentious times, this simple formula sounds like a thing of the past, but if you look past the sensational news cycle and focus in on just one local effort, it will brighten your hopes for the future. In it, Lewis’s character is mistakenly identified as a potential teenaged gang member — even though the actor was 30 years old at the time — who, through exposure to sports like boxing, wrestling and judo, is ultimately set on the right path by a gruff-but-kindly New York City police officer played by a gruff-but-kindly actor named Darren McGavin. Building on Hope has announced its latest project – a huge (and much needed) overhaul of the MPAL building. You can read more about this here. Want to help? Please consider making a donation via the GoFundMe page. The film was art imitating life. As far back as 1914, the New York Police Department was conducting programs to keep young people out of trouble by channeling their energies into recreational and athletic programs. Ultimately, that effort became known as the Police Athletic League — PAL— and for nigh on 25 years now, the Manchester Police Department has been offering the same opportunities for Queen City kids. In its formative years, the Manchester Police Athletic League was literally an academic exercise for founder Dr. Jeffery Czarnec, who spent 23 years with the MPD. The “Why nots?” included a city on the economic brink. It was 1991 ­— five major banks had failed; the real estate, advertising and job markets were in free fall; and the police department was stretched to the max. 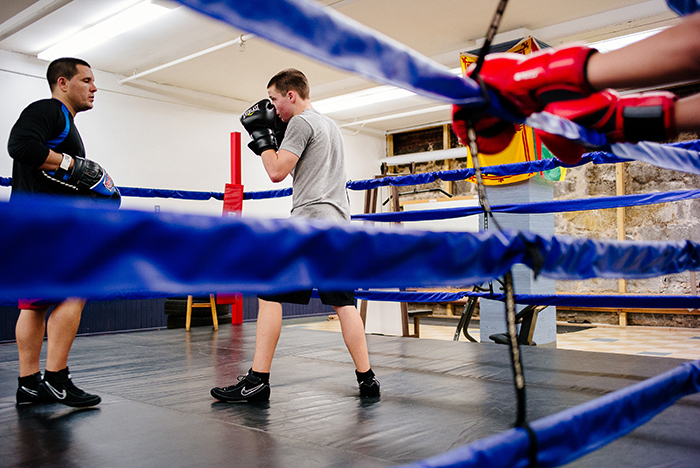 A small gym at the Salvation Army headquarters on Cedar Street in Manchester was home to the first MPAL boxing activity, but even while the kids were trading their first few tentative punches, Czarnec and his core crew — including fellow police officers Bill Cavanaugh and Roland “Red” Robidas — were sharing intelligence with their compatriots on the Nashua Police Department. From boxing and tennis to lacrosse and basketball — the hoops program featured a street-baller chief-in-the-making named Enoch Willard — the program offerings grew as fast as the program’s enrollment, which today, stands upwards of 200 kids. In 1999, MPAL moved into the building once known as St. Cecilia Hall. For the better part of a century, the vast white structure at the juncture of Beech St. and Lake Ave. on Manchester’s East Side had been the social hub of the French-language St. Augustin Parish (see sidebar). When he first proposed its construction, parish founder Father Joseph-Augustin Chevalier donated $10,000 of his own money to the cause. He named it St. Cecilia Hall in honor of the patron saint of music. The hall had a grand stage for musical performances and talent shows, a complete kitchen for wedding receptions and holiday gatherings. It even had bowling alleys in the basement. Today, that basement is where the MPAL boxing team goes through its paces in a community center proudly named for a fallen hero of the Manchester police: Officer Michael Briggs. Such programs would have been unthinkable in 1999, when the building was in serious disrepair. “The opportunity to acquire the building came when the Diocese of Manchester was looking to sell real estate,” says Dan O’Neil, who spent 20 years on the MPAL board before stepping down in September. “We knew it was going to take a lot to make it compliant on life safety codes, but being in the heart of the center city, it’s in a perfect location for the PAL program. Brian O’Keefe was the officer assigned to oversee the rehabilitation of the building, which brought out the best in Manchester. “If you go back to 1999, Dan O’Neil and I worked with Harvey Construction on every detail of the building. Scott Martinelli was the project manager who put everything together,” O’Keefe says, “but it was the late John Zahr from Harvey Construction who worked with Rob Prunier — he’s now one of the co-owners of the company — to get every subcontractor to cut our costs.” The result? A project that was originally budgeted at $1.1 million, came in at $418,000. O’Keefe was still there when the building was finally re-opened in 2004, and he was there as the first full-time PAL officer in the history of the Manchester Police. It is a distinction he carries proudly. Officially, O’Keefe held the MPAL post for six years, but he devoted 20 years to the program. He was succeeded by Rich Ell, who held the job for five years. Current director John Levasseur, who doubles as the boxing coach, has been on the job since May. If you go by the book, MPAL serves kids from the ages of 5 through 18, but sometimes, the book is just an outline. Michael “Kiki” Rivera can’t do that right now. He can’t because he’s out in California. More specifically, he’s at Camp Pendleton, where the Afghan War veteran is a sergeant in the United States Marine Corps. When asked about his first experience with MPAL, there is military precision in his reply. Opened in 1911, Salle Sainte-Cécile, or St. Cecilia’s Hall of St. Augustin Parish, was named for the patron saint of musicians. Here, audiences enjoyed French-language concerts, operas and plays. It was one venue for the annual Festival de la Bonne Chanson (Festival of the Good Song), a competition featuring choral groups from each of the city’s eight Franco-American parochial schools. Many adults, now middle-aged or older, recall having had to sing in French before an audience filled with relatives, nuns, priests and the general public. He was just 14 years old, but he made a wise decision. Those are the stories David Mara likes to hear. He stepped down from his role as Chief of Police earlier this year, but by no means is he relinquishing his role with MPAL. Quite the contrary. “John Jaskolka had a full-time cop here, I had a full-time cop here and I’m sure Nick Willard will keep one here as well,” he says. “This place is a sanctuary, and every day, kids are in here having positive interactions with police officers. So the kids get to do boxing workouts with John Levasseur. They do aikido with Sensei Michael Hovan and judo with Robert Proska, and they do it all under the watchful eyes of the countless police officers who donate their time to MPAL. Cops and kids. The formula works to this very day. An organization that hands out tiny miracles on a daily basis surely deserves its own big miracle at some point. 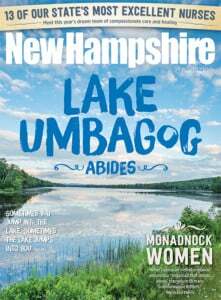 Thanks to a unique New Hampshire-based program, MPAL is preparing to get one. For a quarter century the Manchester Police Athletic League has served a diverse group of inner-city kids — most of them from homes that might be called dysfunctional or marginal — by providing a place to punch a bag, practice judo on a mat, find some homework assistance or just benefit from one-on-one coaching and advice. It’s hard to say how many lives have been changed by this forging of positive bonds between disadvantaged young people and officers of the law, but if you ask the kids, you’ll know that MPAL brings understanding and hope to places where both are in short supply. There are lots of ways to get involved with the Building on Hope project. Visit them on the web at buildingonhope.org for details. And to get things off on a note of celebration, there’s a party at the Michael Briggs Community Center scheduled for Dec. 2, where people can show a little appreciation. There will be an ornament for every member of the local police force with a place to write a note of thanks before hanging it on the MPAL Christmas tree. Refreshments, beer and wine will be provided by local restaurants, and there will be a tour of the building to showcase the scope of the remodeling project ­— plus a holiday performance by the Palace Youth Theatre. Update: The celebration was a huge success! Check out photos from the evening here. Also, here's how you can help! Please consider making a donation to the GoFundMe campaign. Now their mission will be helped by a remarkable gift. The community partnership program Building on Hope has selected the Michael Briggs Community Center, home of the MPAL program, to receive an “Extreme Makeover”-style remodeling effort in the spring of 2016. This is the fourth such project by Building on Hope with previous results each valued between $250,000 and $500,000. The 2016 effort will require in excess of a million dollars to transform the aging facility and open the doors to more kids and even better programs. Interested in helping? You can donate via GoFundMe. The publicity that is expected in the coming year will also take what’s been happening quietly in an old Queen City rec hall on Beech Street and share it with the world. In spite of the recent tensions between police and their communities, cops helping kids is a formula that has changed thousands of lives for the better and made the world a safer, stronger place for decades. There’s no finer example of this miracle than right here in New Hampshire. Donations of money, materials, time and expertise are currently being sought.